Chinese e-commerce giant Alibaba has reported a 15% rise in quarterly profits in its first set of results since it listed its shares in New York. Net income in the July-to-September rose to $1.1bn (£687m). 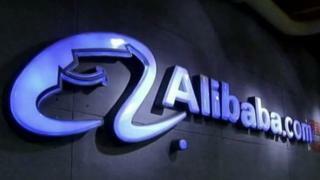 Alibaba, founded in 1999 by Jack Ma, floated in New York in September, breaking records by raising $25bn. The shares have traded around 45% above the listing price in expectation that the firm's rapid growth will continue. The shares rose 4.2%. After taking account of certain one-off costs in the quarter, net income fell by 39%. The costs included $490m in incentive and retention payments to certain executives, and the costs of consolidating newly bought businesses, as well as other investments and marketing costs. Revenue rose 53.7% to $2.74bn, its fastest growth for three quarters, with mobile revenues accounting for 22% of the total. Alibaba's platforms carry 80% of Chinese online commerce, a fast-growing market where spending is forecast to triple from its 2011 level by 2015. Often described as a combination of eBay and Amazon, Alibaba does not sell its own goods, but links buyers and sellers. It says it is the largest online and mobile commerce company in the world in terms of volume. There has been speculation that its main source of earnings - from advertising and sales commissions - might be affected by China's slowing economy. Alibaba's companies include the Taobao and Tmall.com retail websites, which are household names in China but little-known outside the country. It plans to expand into emerging markets, and, eventually, to operate in the US and Europe.